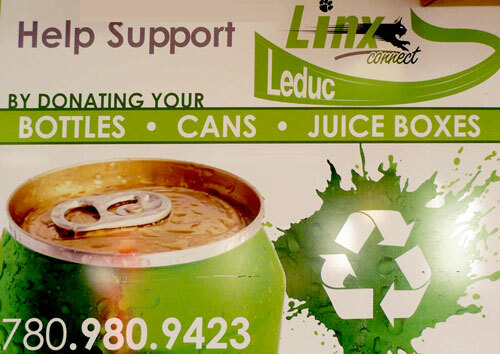 For many years the Leduc Bottle Depot has featured a program where you can donate all or a portion of your recycling refund to any of our partnering local charities. We also help a number of agencies that we donate directly to regularly, over and above our clients' donations. We greatly appreciate all those who join with us in supporting our local volunteer groups, amateur sports teams, community charities and all the other non-profit groups that make Leduc the lively, caring, vibrant city it has become. Leduc Bottle Depot is proud to work with our customers, and our non-profit partners to make a real difference in the lives of the people in our region. Other community fundraising bottle drives as requested. Contact the Leduc Bottle Depot to discover how we can work together to make Leduc even better. Phone or come in and ask for a manager. From there we evaluate what your needs are. Let us know if it will be a date specific bottle drive. We can provide a trailer if you need it. We can also set you up as a long term charity if you have an ongoing fundraiser in which people bring their bottles and tell us that they want their proceeds to go to your organization.